Relate: Which is your favorite class? While not common, this is a question I have been asked more than a few times. Right up there with it is, “Who is your favorite student?” Over the course of a week, I have eleven different classes I will be teaching. A couple years ago at this time, in Istanbul, I was in seventeen classes covering four grades with about twenty students in each class. This year I have twelve classes in first or second grade with 24 students per class. You can imagine how often such a question might occur. The grade teacher for each of my classes then and now wants their class to be my favorite. I will admit that it is not easy to avoid playing favorites. There are some classes that I really look forward to teaching and others that are a bit more of a challenge. Within each class, there are students that are such a joy and others, well… Funny thing is, not all my favorites are other teacher’s favorites. Beyond that, some of the classes in which I am a favorite are the ones ten minutes in I am desperately praying that the length of the fuze on my temper would magically grow a lot longer because I know I am reaching the end of it. As hard as it sometimes might be, I do my best to not let any of that show as I try hard to treat each student and each class with an equal measure of love and respect. 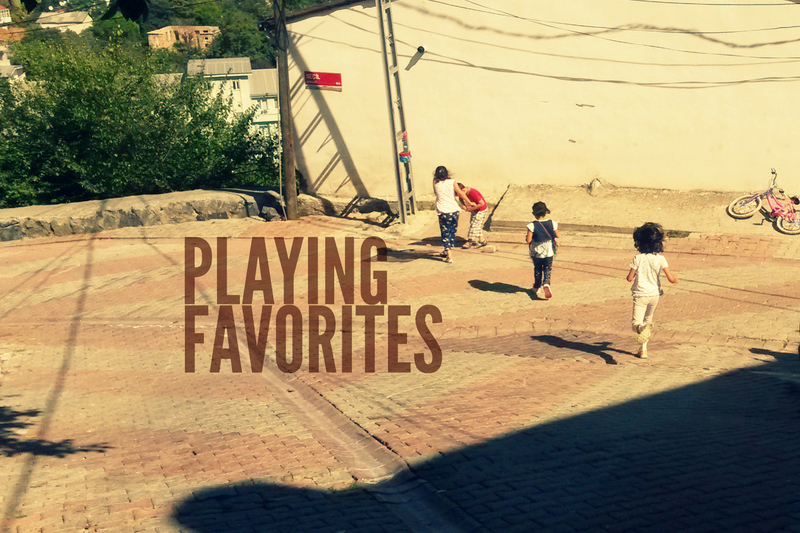 React: Parents, teachers, bosses… playing favorites does nobody any favors. Each and every child (student/employee) is created differently. Some will be just like you, others are as different as night and day. Some will be brilliant others will have to struggle hard just to maintain a C average. Some will be natural athletes and others will find chewing gum while simultaneously walking a straight line to be an unconquerable challenge. Some will start talking the moment they wake up and continue doing so well past bedtime while others you will have to lean in just to hear their whispered three words for the day. Some will be beautiful while others will look more like me. Jealousies will abound. Rivalries will flourish. They don’t need our manifest favoritism to feed into them. God loves each and every one of us the same even as He deals with us all in a unique way best suited to who we are. We need to strive to do the same for others as well. This is what loving our neighbor is all about. I am so grateful that You have poured out Your love and grace on one as unlovable as me. As I go about my day, and as I enter my classrooms, there are definitely some people I will interact with who are much more of a challenge to love. Help me to make the extra effort to see them as You do. Help me to love them as You do. I pray that everyone I speak to would be, in their own unique way, my favorite… just as they are Yours. As a teacher’s aide, sometimes working in P.E.,when the call goes out to pick a partner or make a foursome, there are the same children who have to go to the center of the gym for the coach to find them a partner or a foursome to join. I feel such empathy because growing up, I had to be paired by the coach too. Do we play favorites? We know that often leads to ineqiuity and trouble which are not necessary. The Lord commands us to love all as He does. Thanks so much. As a former teacher, this really resonates with me. And as a Christian, it’s equally important: God doesn’t play favorites and we shouldn’t either. I, too, as a teacher found it tempting to gravitate towards the more popular ones. Interesting force of nature. Fortunately, I had a “math skills” class in sixth period that was populated solely with the struggling, lonely, unpopular kids. It forced me to mentor them, and I’m glad I did. The results were great. They deserve it. That was really nice to read, Brandon. So well spoken. God is so good… Always. I have nominated you for The Versatile blogger Award. Please check my post. Thanks for all the beautiful writing. I just read that passage this morning. Playing favorites doesn’t do anybody any favors for sure! Playing favorites has dangerous consequences for any parent, boss, or anyone in any kind of authority. This lesson goes all the way back to the first book of the Bible. It is nice to have favor from God through someone. I believe God watches us, and knows our hearts. No good thing does he withhold from those who walk uprightly. God looks on the heart, and knows who walks uprightly. We look on the outward appearance, and we judge without seeing the heart. God knows the heart, and He knows where the wickedness is in a person. I believe repentance causes God to withdraw the planned calamity. Sorrow for sins, and regret for sinning and turning to the right path are all part of the change that we go through when we want a closer walk with Him. The cost of Discipleship is a wonderful book. A disciple counts the cost, and takes the plunge. Hi, Matt and God bless you. It’s been a while but I am back. God was certainly dealing with me last year. I will say that some students end up being a teacher’s pet without even trying. I was bullied in school because other students thought I was the teacher’s pet and did everything I could to be that. The thing is, when you have a student that is focused on learning, obedient in class and helpful, the teacher may without even being conscious of it choose them more often to get a job done. I was a straight-A student and loved school. I really loved learning. The point I am making is that it is not always intentional. I am reading the Bible from Genesis to Revelation for the year and finished the story of Joseph not long ago. It is important to not play favorites but there are times when God gives you favor. Joseph had God’s grace and favor in his life, big ego and all. I love this story because it shows what is meant for evil, God turns it around for His glory and His purpose. As humans, we can try to not play favorites. And, when we recognize we are doing just that, we must turn to the Lord for His way and not ours. I do believe there are times when we are doing something and don’t recognize it until the Lord shows us the error of our ways. I always enjoy reading what you post because you give us something to truly think about. Although I have been on hiatus, I look forward to catching up. Be blessed and Happy New Year! I think there’s always a reason in what we experience every day and some “favours” may mean totally different things from what we expect and, obviously, viceversa, being “second bests” might be meant to lead somewhere…. Great post! I don’t know why it made me think of my current situation: my son was picked on one day at school. It really upset him obviously. It broke my heart. The next day, he came home and said the day went better but now the bully was back to picking on the kid he picked on everyday instead. My son pointed them out on the class picture and I remember the little guy that was getting picked on from a day I volunteered in the classroom. I remember even that day thinking that little boy seemed like his spirit had been crushed. Little did I know it was bc he was picked on. My son said he hated how that made him feel and so he asked him to join his group for their group projects. My son tends to naturally be the “goodie goodie” who loves to follow the rules etc and I have a feeling that’s why he was picked on that day. But, I am so grateful he has the eye and heart (even at the age of 8) to notice those who are unfavored and try to include them. It was a learning experience for all of us.